It was another Saturday night, I didn’t have nobody. I had some money, because I had just gotten paid. 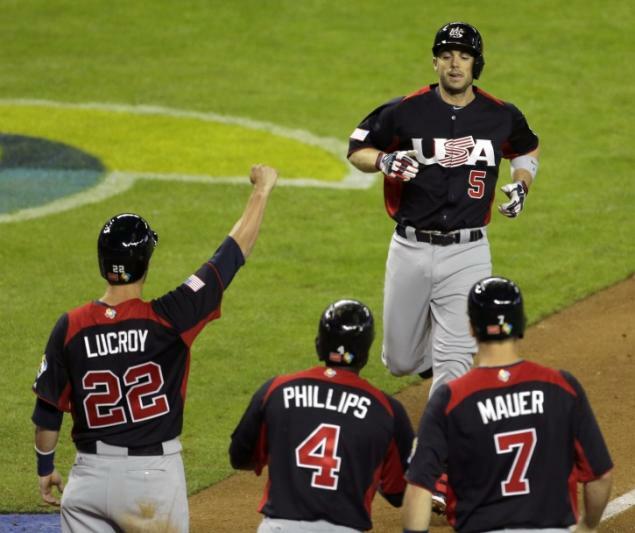 How I wished I had something to do – and then I went on Twitter and saw that David Wright of the New York Mets had crushed a grand slam homer for Team USA in the World Baseball Classic, putting them ahead 6-2 in front of Team Italy. I flipped on the game. Daisuke Matsuzaka is my case in point. But as I continued to watch Teams USA’s game vs. Team Italy, my feelings slowly changed. By the end of the night, I was actually interested in the WBC, a position I never imagined I’d be in when the tournament commenced. A couple of storylines have put me over the top. 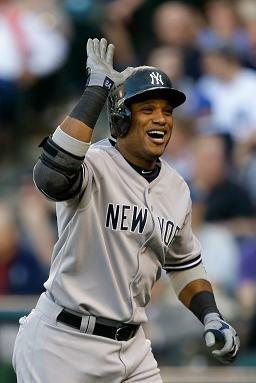 First off, Robinson Cano has been an absolute beast in the WBC, playing for his homeland, the Dominican Republic. The studly second baseman was named MVP of Pool C, cracking four extra base hits (including an opposite-field home run), five RBIs, while batting .600 over the first three games. 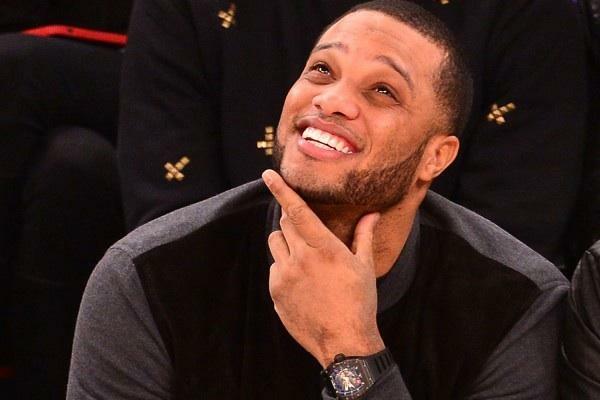 The DR went on to advance in the WBC; Cano ready to lead his squad against Wright and Team USA tonight, in fact. Given the concerns and recent, unexpected injuries the Yankees have suffered (Mark Teixeira and Curtis Granderson) it’s overly encouraging to see Cano slaughtering the ball the way he’s been in the WBC. 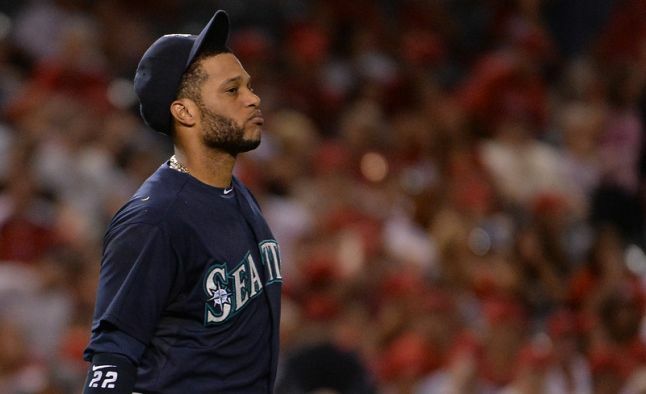 Come April 1, if Cano keeps it up, there won’t be much to worry about when he steps into the batter’s box. There was also a second piece of WBC business that piqued my interest. 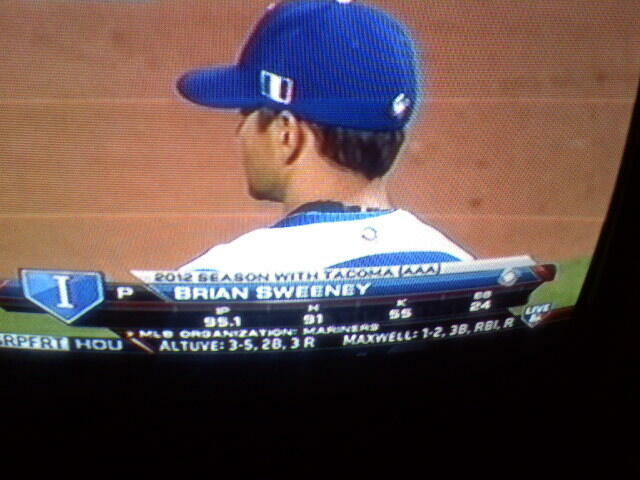 Italy had a familiar reliever on its roster: my paison, Brian Sweeney. I only say “had” because last night Team Italia was ousted by Puerto Rico, a come-from-behind effort by way of sloppy Italian defense leading to the Azzuri’s downfall. I was pleasantly surprised – and in a big way, proud – to see my fellow Mercy College alumnus on the hill in front of a worldwide audience and a packed house at the new Miami Marlins ballpark. 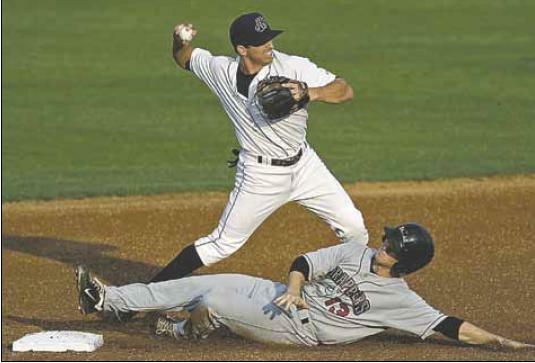 As most readers of the blog know, I interviewed Sweeney in July, 2010, weeks after he faced the Yankees in the Bronx. He went on to make several appearances vs. the Bombers over that summer, and got the likes of Teixeira, Derek Jeter, Alex Rodriguez, Nick Swisher, and Brett Gardner out. Using his signature changeup which he learned pitching for Mercy, some of the most powerful Yankees didn’t stand a chance against Sweeney. And during the WBC, Sweeney added some more names to his list of big outs. In Wright’s first at-bat following his trip to granny’s, Sweeney got the Mets’ third baseman to pop out. He followed suit by walking the Marlins’ own Giancarlo Stanton, Sweeney’s changeup painting the black; barely missing the outside corner for a walk culminating a 13-pitch at-bat. He went on to get catcher Joe Mauer (Minnesota Twins) to fly out to left field and first baseman Eric Hosmer (KC Royals) to foul out behind third. 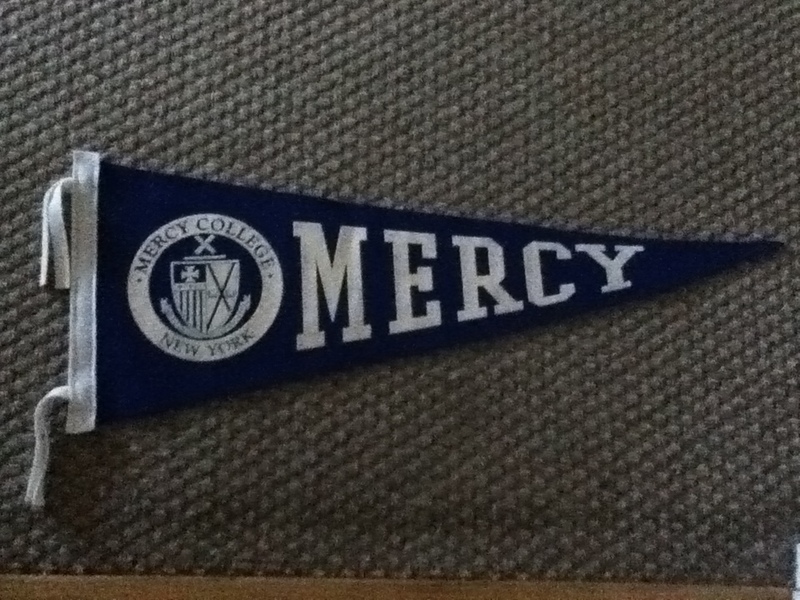 Not a bad night at the office for a Mercy College grad. 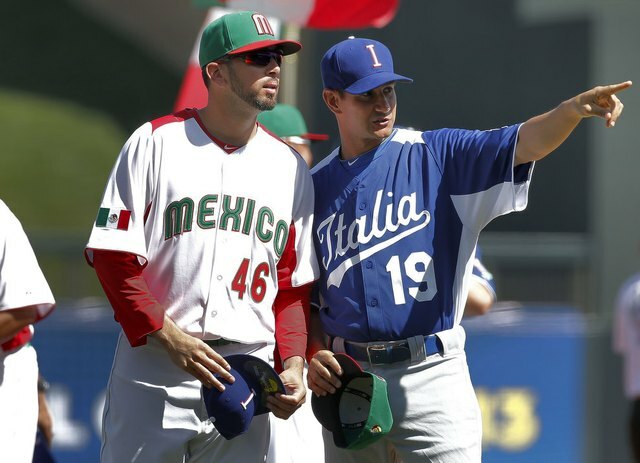 Team Italy had two more losing efforts vs. Cano’s Dominicans and Team Puerto Rico – both narrow losses; one-run games. Over the course of those two games, Sweeney struck out Alejandro De Aza (Chicago White Sox) swinging, and got both got Jose Reyes (Toronto Blue Jays) and Hanley Ramirez (LA Dodgers) to fly out. Unfortunately Sweeney was on the hook for the loss in last night’s elimination game to Puerto Rico, although the decision was more reflective of shoddy defense: particularly on the left side of the infield’s behalf. Italy’s shortstop Anthony Granato was eaten alive on a number of ground balls, and third baseman Alex Liddi didn’t curb the problems, missing an easy out by coming off the bag at third on a force play. Yet Sweeney’s participation in the WBC wasn’t what made me entirely proud. After the loss, the 38-year-old journeyman right-hander stood on the top step of the dugout and tipped his cap to the fans and to Team Puerto Rico – a class act, all the way through. Despite the ousting, he showed great sportsmanship and a graceful attitude. That’s a Mercy College guy for you. My hope now is that he catches on with a team this spring. Hopefully for him, it’s the Seattle Mariners, seeing as how he told me in the interview he always wanted to pay dividends for them. They gave him a chance in the show; I suppose he feels he owes them. 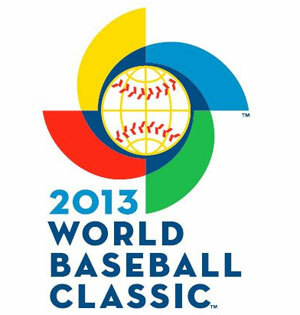 As for the rest of the WBC, my interest has been sparked. Next time there’s a night within the next couple of weeks before Opening Day and I don’t have nobody – regardless of whether or not I just got paid, I’ll have something to do: watch the WBC. Despite going 2-5 on their recent road trip which included a sweep at the hands of the suddenly “Moneyball” Oakland Athletics team, the Yankees still possess the best record in baseball at 59-39 and continue to sit atop the AL East, looking eight games down at the Baltimore Orioles and Tampa Bay Rays, and 10 1/2 games down at the Toronto Blue Jays and Boston Red Sox. A number of things have happened in Yankees Universe and the baseball world in general these past couple of days. Therefore in the spirit of old-fashioned blogging, I figured I would give some thoughts, opine on some topics, and even throw in a story or two – just for old time’s sake. Before Monday’s series opener vs. the Mariners huge news broke via the Twitter wire: the Yankees had acquired Ichiro Suzuki from the Mariners in exchange for minor league pitchers D.J. Mitchell and Danny Farquhar. 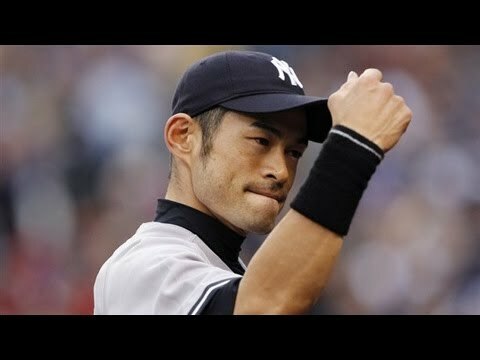 Just like that, Ichiro is a Yankee. 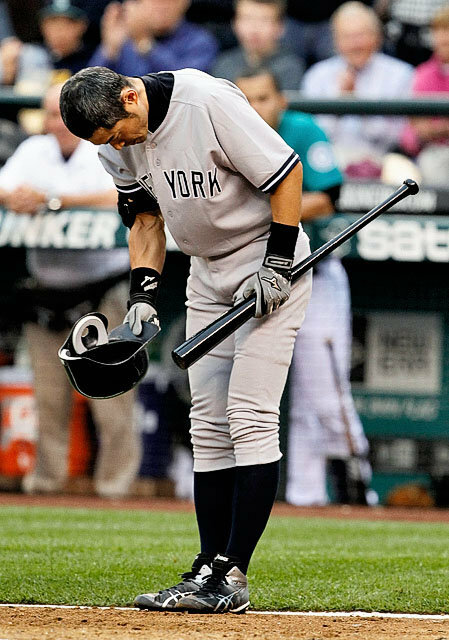 The news came as a shock to most Yankee fans, as well as me, seeing as how Ichiro spent his entire MLB career with the Mariners. Not only that, but the move was on no one’s radar; nobody saw it coming. It was obviously a trade General Manager Brian Cashman kept under wraps until it became official. The first notion that entered everyone’s mind was the jersey number. Throughout his career Ichiro has always worn number 51, a number that has meant a lot to the Yankees – being that Bernie Williams wore it for 16 years in pinstripes. 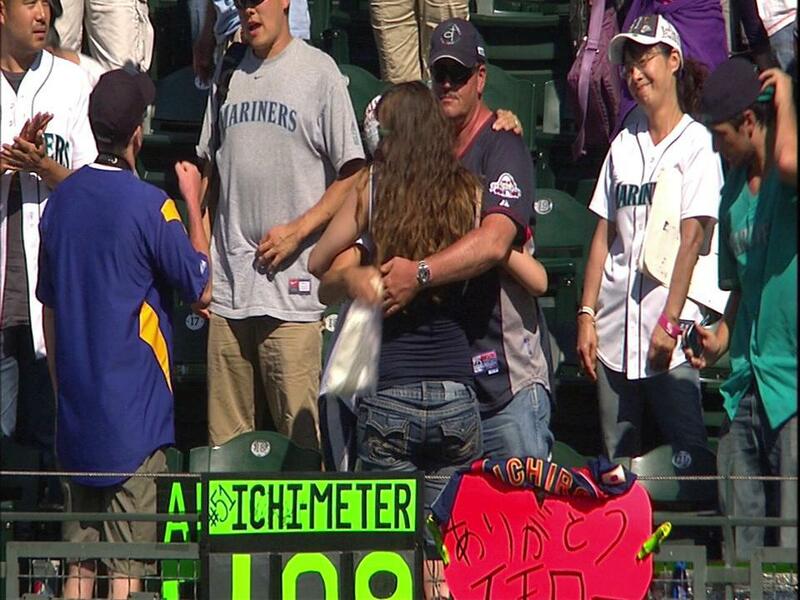 To everyone’s relief, Ichiro chose to take 31, respecting Williams and the jersey number. Unfortunately Dave Winfield didn’t seem to take too kindly to Ichiro taking 31. In his first three games as a Yankee, Ichiro has collected three hits and has stolen a base. He hit eighth in the batting order in his first two games, and led off yesterday, showing his versatility in the lineup. Plug him in anywhere and he can still hit. This was a good move for the Yankees. 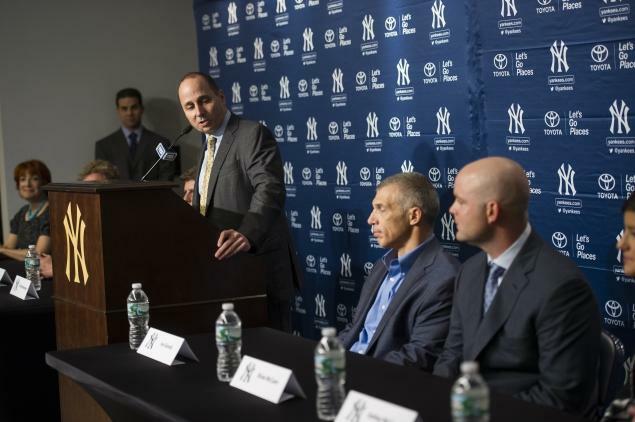 With Brett Gardner’s season over and Raul Ibanez and Andruw Jones signed to be designated hitters and fourth outfielders, the trade makes sense. The Mariners organization is becoming tailor-made for young players and the veteran Ichiro, 38, didn’t feel he fit in with them – hence why he requested the trade. Hats off to the Mariners not only granting his wish, but commenting on how he deserves to a chance to win a title before his career ends. It’s obvious Seattle isn’t going anywhere this season while the Yankees, now with Ichiro’s help, could potentially go very far. After the final out was made in yesterday’s 5-2 win over the M’s, Ichiro waved goodbye from right field to the Mariners faithful. The fans seemed heartbroken at the thought of their golden boy for so many years leaving town. The sight of it all made me sad. I couldn’t help but remember the way I felt when Joe Torre managed his last game in October, 2007. When someone has meant so much to a franchise, I know first-hand that it’s extremely difficult to see them leave. 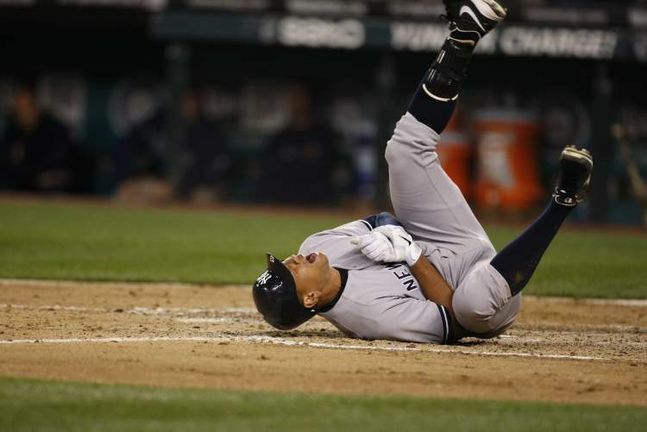 On Tuesday night in Seattle, Alex Rodriguez was beaned on the left hand during an at-bat in the eighth inning – the third HBP in the game (Ichiro and Derek Jeter had previously been plunked). Rodriguez fell to the dirt in agonizing pain and left the game. Afterward it became known that A-Rod has a broken hand and will miss 6-8 weeks; the Yanks are hoping to have him back by the middle of September. Losing A-Rod is a blow, but perhaps it’s better the Yankees lost him now as opposed to a time when they really needed him. 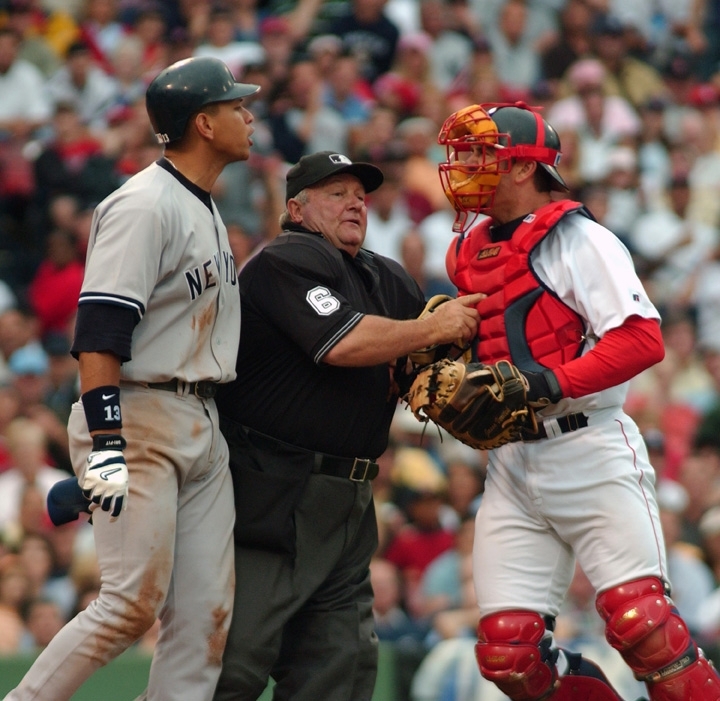 For example, if this injury occurred in 2005 or 2007 when Rodriguez put the team on his back and carried it, the Yanks would be in serious trouble. Thank God we live in the year 2012. Because now there are several players who are capable of coming up in big spots to bring the runs home, like Mark Teixeira, Curtis Granderson, and Robinson Cano, among others. Not to mention in ’05 and ’07 the Yanks were constantly battling for first place, locked in a dogfight with the Red Sox for the division. Obviously that’s not the case this year. Although taking Rodriguez’s bat out of the lineup basically takes an offensive threat and a presence out of the Yankees’ arsenal, there’s more than enough power to compensate for it. As far as defense is concerned, Ramiro Pena was called up to fill A-Rod’s roster spot and will obviously see time at third base along with Eric Chavez and yesterday’s hero, Jayson Nix. There’s also speculation the Yankees might go after Chase Headley, the Padres’ third baseman, before the trade deadline on Tuesday. 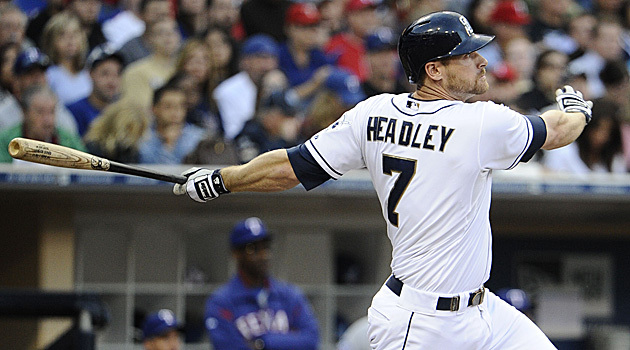 Headley, 28, is hitting .267 this year with 12 homers and 51 RBIs. A-Rod looked devastated after the game; he was clearly not just in physical pain from the HBP and the fracture, but emotional pain as well. It was apparent the news of him missing more time due to another injury impacted his psyche and left him in disbelief, as evidenced by his words when he met with the press. The Boston Red Sox will visit Yankee Stadium for the first time this season tomorrow night, as the Bombers and BoSox get set for a three-game weekend series. The last time these teams met, the Yankees took three of four from the Sox in Beantown. The Red Sox are coming off a losing series to the Texas Rangers while the Yanks (as it’s known) just took two of three from the Mariners. Aaron Cook (2-3, 3.50) will start for Boston tomorrow night while the Yanks will counter with Phil Hughes (9-8, 4.09 ERA). Saturday afternoon in a match-up of aces, CC Sabathia (10-3, 3.30 ERA) will toe the rubber, facing off with Jon Lester (5-8, 5.46 ERA). Finally on Sunday night, 10-game winner Hiroki Kuroda will gun for win number 11 – while Boston has not yet listed a starter for the finale. 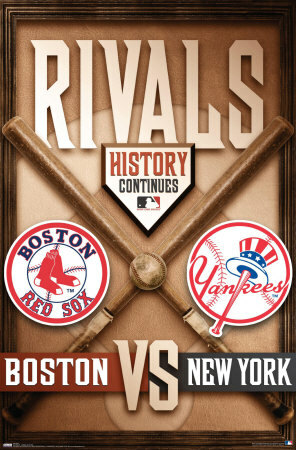 Has the Yankees-Red Sox rivalry lost its luster? Right now, I think it’s almost dormant. 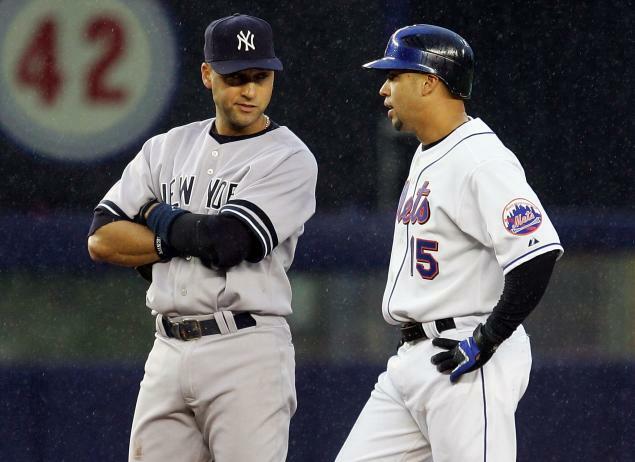 With Bobby Valentine shooting off his big mouth about Derek Jeter over the off-season, I thought for sure the rivalry would be ignited and something would happen this year; perhaps the boiling of some bad blood. So far, however, nothing. But I suppose it’s not necessary when the Red Sox are AL East cellar dwellers and not pushing for first place at all. If Boston was in the pennant race, there might be more of a competitive element thrown into the mix. Yet, it is clear that the days of A-Rod and Jason Varitek duking it out are long gone; Curt Schilling wanting to “make 55,000 people from New York shut up” is surely passé. It could take awhile – maybe even a number of years – before the Yankees and Red Sox go back to where they were in 2003, 2004, and even 2005. Then again, you never know. It only takes one bean ball to start a fire. As promised, I’ll throw in a little story to close this one. The last time I blogged, I wrote about my experience covering the Hudson Valley Renegades, as most readers probably know by now, the same team I interned for. I wound up covering them again last Friday after I saw “The Dark Knight Rises” (go see that movie if you haven’t yet done so). Escaping damage in the ninth inning and with some eighth inning heroics, the Renegades beat the Aberdeen Ironbirds 3-2 – the Ironbirds being a farm team of the Baltimore Orioles, for the record. After the game I went from the press box to the clubhouse and interviewed Jared Sandberg, the Renegades’ skipper, former Tampa Bay Devil Ray, and nephew of Hall of Famer Ryne Sandberg. Tampa Bay Rays’ 2011 first round draft pick Taylor Guerrieri once again started, and Sandberg actually noticed that I had been there for Guerrieri’s previous start. “You were here the last time Taylor pitched (against Mahoning Valley) weren’t you?” he asked me after the interview. “Oh, I saw that article from last week!” he exclaimed. Frightened, I had no idea what he was going to say next. Honestly though, I am having a great time covering this team. They are performing extremely well, and are in first place in their division in the New York-Penn League, ahead of the likes of the Brooklyn Cyclones and Staten Island Yankees. I’m looking forward to covering more of their games and I’m anxious to see how they are going to finish. When I interned for them in 2010, they ended at 39-36, missing the playoffs. At 24-13 right now, it looks as if they will indeed eclipse their 2010 record and go who knows where. Hopefully to a League title. I was driving home from covering a high school basketball game tonight and I felt like the General Manager of a baseball team – or maybe more accurately a Yankees beat writer. My good friend Brian text messaged me, breaking the big news. I immediately called him, and we began discussing the moves and the circumstances surrounding the transactions the Yankees made. Just when we all thought this off-season for the Yankees was dead, tonight happened. A pulse; some life in the dead of winter. 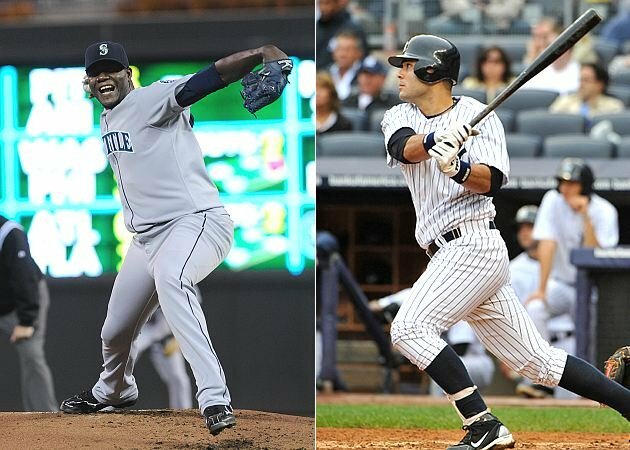 The Yankees made a huge trade, swapping rookie catcher/designated hitter Jesus Montero and reliever Hector Noesi to the Seattle Mariners in exchange for flame-throwing, right-handed starter Michael Pineda and Single-A righty Jose Campos. You’d think that would be enough for one night, but the Yankees weren’t done. 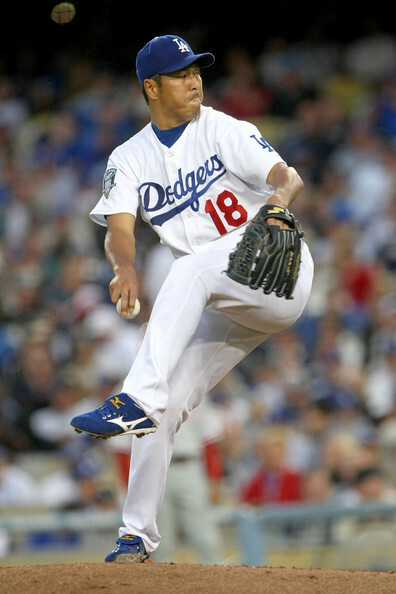 Along with swapping Montero for Pineda, they deepened their rotation with the signing of Free Agent starting pitcher Hiroki Kuroda, who had been with the Los Angeles Dodgers since 2008. Just like that, the Yankees have some pitching depth. Pineda has the potential to serve the Yanks as a viable number two starter behind CC Sabathia – a role A.J. Burnett has failed to live up to these past two seasons. Kuroda can help fill the middle and back end of the rotation, along with Burnett, Ivan Nova, Phil Hughes, and Freddy Garcia. Obviously with seven starters, the Yankees’ hurlers will be seriously duking it out in Spring Training for a spot in the suddenly-populated rotation. There were some rumblings after the Pineda deal was finalized that Hughes could be on the block, yet nothing is confirmed or set in stone. But trading away one of the excess starters is another story for another day; a bridge that can be crossed when the Yankees get to it. Right now let’s look at what the Yankees gained and what they gave up. 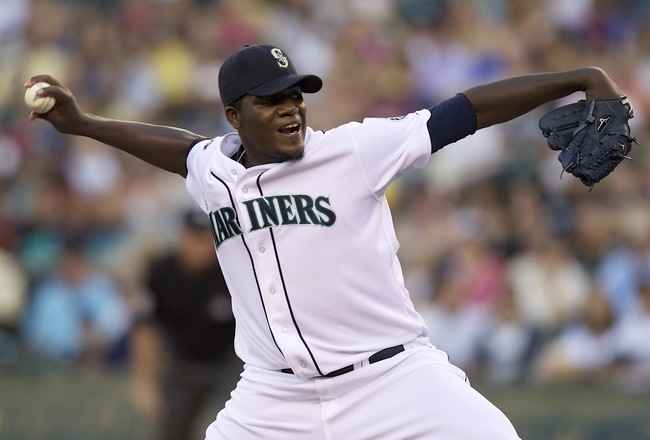 Pineda was an All-Star in his first MLB season last year, finishing 2011 with a record of 9-10 and a 3.74 ERA. The 22-year-old (23-year-old on Wednesday, Jan. 18) logged 171 innings and struck out 173 batters over that span. He gave up 133 hits and walked 55 of the 696 batters he faced. Pineda finished fifth in the American League Rookie of the Year voting – behind his new teammate Nova, who came in fourth place in the voting. His numbers were acceptable for a rookie last year and for a 22-year-old kid to be handed the number two spot in the Seattle rotation behind Felix Hernandez – a rotation that didn’t exactly receive a great amount of run support – and flourish the way he did was nothing short of remarkable. Although his overall numbers were stellar (all things considered) his line against the American League East teams kind of turns me off. 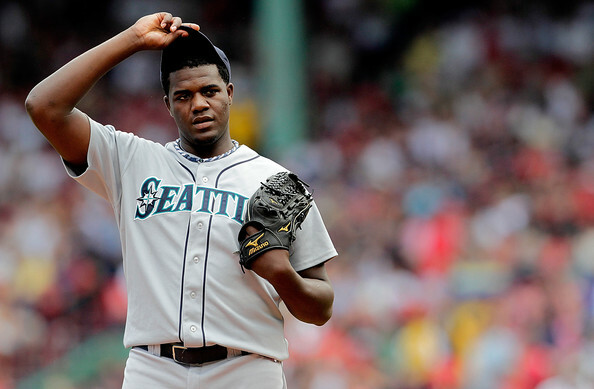 Pineda had a 4.73 ERA in nine starts against AL East opponents. It almost goes without saying that as a Yankee starter, he will be expected to be able to beat the Boston Red Sox. Case in point: July 24, 2011 vs. the Red Sox at Fenway Park. Pineda allowed seven earned runs on eight hits in just 4 1/3 innings pitched. He struck out four batters and walked one, as the Red Sox topped the Mariners, 12-8. Five of Pineda’s seven runs surrendered came in the first inning; pounded from the get-go. Looking at that example doesn’t make me feel great about the trade. I think the best thing the Yankees can do is let Pineda be himself; stretch him out and allow him to throw as many innings as he did last year, if not more. 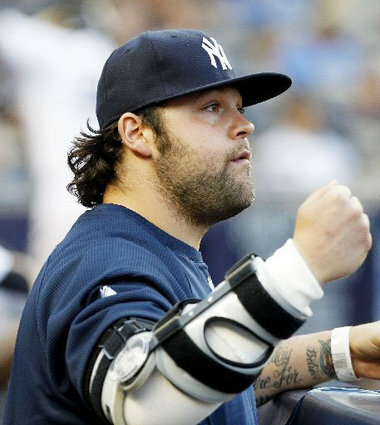 What they can’t do is put him on an innings limit, given his age, and turn him into another version of Joba Chamberlain. I would also hope the Yankees learned the first time, and will choose to either permanently place him in the bullpen or in the rotation without switching him in and out. Considering what they gave up, I’m going out on a limb, but thinking the rotation is where we’ll be seeing Pineda. While it remains to be seen how he fairs in Spring Training (let alone in the Bronx this upcoming year) I know one thing is for sure: whatever they do with him, they need to be careful. Otherwise they’ll end up with another young arm that needs Tommy John surgery. They wanted to avoid Tommy John altogether in Chamberlain’s case, and in the end he wound up needing it anyway. As far as what they gave up: we barely knew Montero, although we knew the Yankees were preserving him for a long time. The 22-year-old powerhouse was called up in September and put on a little bit of a hitting show in the 18 games he played in ’11. Montero clubbed four homers in 61 at-bats with four doubles, 12 RBIs, seven walks, nine runs scored, and 20 hits. Overall he notched a .328 batting average and secured a .590 slugging percentage. For his short time in the show, he has certainly made it count. Overall, I see this as a trade that could basically be a win for both sides. Seattle gets a power bat and a DH, something they hadn’t exactly possessed these past few years. 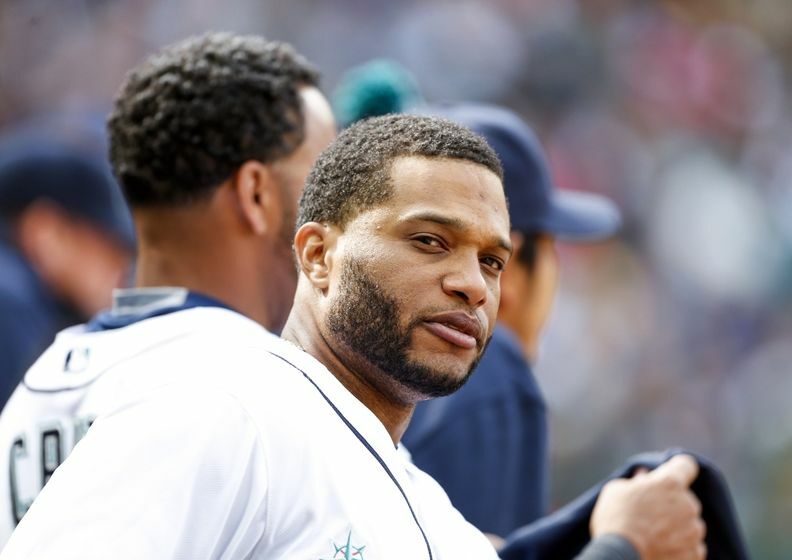 The Mariners also have to realize they received a player who could be the 2012 Rookie of the Year, if he has a so-called “coming out party” this season. Montero could do it. I have no doubt in my mind. In return the Yanks get a potential number two starter, something they’ve had the last two years but haven’t had consistently. Hughes was the Yanks’ number-two man in 2010, but seemed to pitch with a tired arm down the stretch. Plus, we all saw how poorly he pitched in the ALCS vs. Texas. Nova turned into the number-two starter last year – and let’s not forget that he left the deciding game of the ALDS vs. Detroit with an apparent arm injury. The Yankees needed that consistent second guy, and now they might have him. And not only do they have a number two starter, they added a middle man: Kuroda. 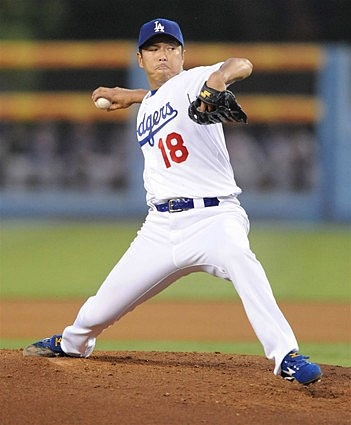 Since 2008 for the Dodgers the 36-year-old Kuroda is 41-46 with an ERA of 3.45. Last year he tossed 202 innings giving up 77 runs on 196 hits while fanning 161 batters and walking 49. He also recorded 13 wins, a career-high for him in MLB. The Yanks signed him to a one-year contract worth about $10 or $11 million. He was never an All-Star and he isn’t the flashiest pitcher in the world, but he provides the Yankees with a little bit of depth. 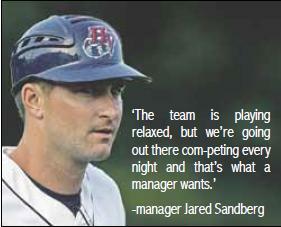 If he can give them 10-12 wins from the third, fourth, or even fifth spot in the rotation, they have made a good move. 1) The fact that he’s pitched his entire career in the National League. 2) The Yankees’ history with Japanese starting pitching. If Kuroda can adapt to AL hitters, learn to work in and out of trouble – and shed the stereotype Hideki Irabu and Kei Igawa left for him – I know he will do fine. Now that the Yankees have a stacked rotation, essentially they gave away their designated hitter in Montero. It frees up a huge spot in their already-potent lineup and it begs the question: who will DH for the Yankees in 2012? Will they sign Carlos Pena? 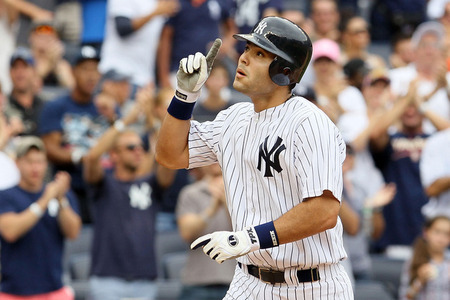 Is Johnny Damon coming back to New York? Was giving away the DH a ploy by Brian Cashman to set up the signing a very powerful Free Agent? On June 15, 1964, The Chicago Cubs traded away left fielder Lou Brock to the St. Louis Cardinals for a right-handed pitcher named Ernie Broglio. Brock went on to enjoy an outstanding career; six All-Star selections, two World Series Championships, The Babe Ruth Award, The Roberto Clemente Award, his number 20 is retired by the Cards, and in 1985 he was inducted into the National Baseball Hall of Fame. Not bad for a career’s work. Broglio on the other hand…well. Not many people remember his name and he didn’t do much else with career after he was dealt to the Cubs. He finished his pitching career with a 77-74 record, a 3.74 ERA, and 849 strikeouts. His only accomplishment: winning the most games in the National League in 1960. Being a devout Yankee fan, there are several instances (in my lifetime) I can think of when the Yankees either made a terrible trade or a bogus free agent signing. With the recent departure of Javier Vazquez, and in the spirit of “Free Agent Frenzy,” I got the idea to write about some of the worst moves the Yankees have made over the years. So without any further ado, I give you my top Yankee trade/free agent busts. On an episode of the TV show Seinfeld, George Costanza’s father Frank (played by Jerry Stiller) scolded George Steinbrenner for trading away a 23 year-old right fielder by the name of Jay Buhner. The Yankees gave Buhner to the Seattle Mariners in July of 1988 along with two minor leaguers–Rich Balabon and Troy Evers–in exchange for Ken Phelps. To this day, the trade is considered by many fans to be one of the worst trades the Yankees ever made in their history. A classic “Brock for Broglio,” no doubt. Buhner went on to become an All-Star and win a Gold Glove in 1996, and in 2004 he was inducted into the Seattle Mariners Hall of Fame. As far as numbers are concerned, Buhner averaged almost 22 home runs per season after leaving the Yankees and knocked in over 100 runs for three consecutive seasons from 1995-97. It is obvious Buhner established himself on both sides of the field and overall was an excellent player. Phelps on the other hand just faded away. He had only caught Steinbrenner’s eye initially because he was able to hit 14 home runs in half a season–a feat the Yankee owner viewed as impressive. Unfortunately he gave away a player who went on to enjoy success and in return received a player who went on to become a nobody. As a Yankee fan did losing Buhner upset me? Did watching him perform so well year after year against us annoy me because I knew he could have been doing it for us? I liked Buhner, even though he was on the Mariners. He had such poise and talent; he could swing a hot bat, could play stellar defense, and yes it was hard to watch him knowing he was once a Yankee. But at the same time, the Yankees had a pretty good right fielder of their own named Paul O’Neill–a man who earned the nickname “The Warrior” by Steinbrenner. Having O’Neill may have even been better than having Buhner. After all, O’Neill was a force in the Yankee Dynasty. Without him, the Yankees may not have won the title in 1996 and 1998-2000. O’Neill battled year in and year out and because of his work ethic, he helped guide the Yankees to the Championship. And for as good as Buhner was, he never won a title. With O’Neill in right field, the Yankees did. You know things aren’t going well for you when your boss calls you a “Fat P—y Toad.” Hideki Irabu was called this name by Steinbrenner, simply because he did not cover first base on a ground ball–in Spring Training, no less. In fact, The Boss didn’t even allow his pitcher to travel with the team to Los Angeles after the incident because he was so infuriated. That’s what you would call a serious “FML” experience. The San Diego Padres had purchased Irabu’s contract in 1997 from the Chiba Lotte Marines of the Nippon Professional Baseball League in Japan. Believe it or not, his purchase led to the current format used today that MLB enacts to sign Japanese players. Without this deal, players like Ichiro, Hideki Matsui, Daisuke Matsuzaka, and Hiroki Kuroda would have never made it to the Majors. Apparently Irabu wanted to act as much like a big-name superstar as he could, because he refused to sign with San Diego. What’s more, he stated he would only like to play for the Yankees. That’s a bit egotistical, wouldn’t you say? The Yankees eventually had to offer San Diego players in exchange for the rights to negotiate with Irabu. When it was all said and done, the Yanks gave up, $3 million, Rafael Medina, and Ruben Rivera (cousin of Mariano Rivera) for Homer Bush and the rights to Irabu–who was later signed by New York for $12.8 million over four years. A complicated exchange and one that never really did pay off. Not exactly worth $12.8 million, if you ask me. I suppose the Yankees could have gotten a little more bang for their buck; or they at least could have signed him for less money. Irabu collected two World Series rings (1998 and ’99) but didn’t even last all four years he was under contract with the Yankees. After 1999, Irabu was traded to the Montreal Expos (now known to most fans as the Washington Nationals) for Ted Lilly, Christian Parker, and Jake Westbrook. He finished his MLB career with a 34-35 record, a 5.15 ERA and 405 lifetime Ks. I guess we will never know, Mr. Costanza. I can understand why Steinbrenner and the Yankees sought Kevin Brown. He had racked up a lifetime of accolades, including a World Series ring. He was even named “Pitcher of the Year” by The Sporting News in 1998. Brown had made a number of All-Star game appearances, and had the ability to carry a pitching staff working as the ace. What I cannot understand however, is how a pitcher can get so frustrated that he throws a punch at a wall and breaks his pitching hand in the process. I mean, if you are a pitcher and you have a bad game and get called on it by your teammates or manager, slam your glove to the dugout floor. Take a bat to the dugout water fountain, if you are feeling especially psychotic. Or my personal favorite, knock over a Gatorade cooler. But don’t ever, under any circumstances, try to pick a fight with a wall and use physicality. The wall is guaranteed to win every time. With that sheer display of immaturity, I not only lost all respect for Brown but now consider him a terrible move the Yankees made. I don’t really see it as a “Brock for Broglio” per se, because the Bombers only gave up Jeff Weaver, Yhency Brazoban, Brandon Weeden, and $2.6 million for Brown. In 2004 the Yanks probably felt Brown would help lead their pitching staff. But those feelings were not exactly well-founded. In 2004 Brown went 10-6 with a 4.06 ERA, which weren’t bad numbers for an older pitcher who was playing for the first time in the crazy New York atmosphere. In fact, Brown pitched rather well in the ’04 ALDS vs. the Minnesota Twins, posting six innings and only giving up one run. The Yanks went on to win the series 3-1. However, his ALCS Game Seven outing vs. Boston is what he is most infamous for; pitching less than two innings and allowing five runs, including a two-run homer to the hated David Ortiz. Essentially, Brown didn’t give the Yankees a shred of a chance to come back and win the pennant. All Yankee fans, including myself, were outraged. He picked the worst day of the season to have a poor outing. The most important game ever and Joe Torre used the least intelligent member of his pitching staff. In 2005, Brown attempted to come back, but was sidelined due to injuries. He finished the year in ’05 with a 4-7 record and an ERA of 6.50. The following off-season, he announced his retirement. I don’t blame the Yanks for trying to catch lightening in a bottle with Brown; there is no denying that he was a decent pitcher in his prime. Yet, it did turn out to be a bad move because they caught Brown in the twilight of his career. As a Yankee, he was nothing but a shell of his former self and could not get the job done when it came to nut-cutting time. Overall, I chalk Brown up as a big loss for the Yankees. $39.95 million that could have gone to a better cause. Charity, I suppose. Following the 2004 collapse to the Red Sox in the ALCS, the Yankees were convinced they needed starting pitching. Along with the big signing of the Big Unit, Randy Johnson, the Yanks sought and landed free agent hurler Carl Pavano. I used the term “hurler” not because Pavano is a starting pitcher, but because just by mentioning his name makes me want to hurl. Not for nothing, Pavano was coming off his best career season, numerically, in ’04. In his contract year with the Florida Marlins, he won 18 games while only losing eight and posted a respectable 3.00 ERA. His numbers made him a hot free agent commodity and multiple teams, including Boston and the Cincinnati Reds, wanted him. Ultimately it was the Yankees who got Pavano and I wish they hadn’t. It would have been better for them if the Red Sox or Reds had wasted their money on him. At first Pavano appeared to be a decent pitcher. He gave the Yankees quality in seven of his first 10 starts, putting together a 4-2 record and posting a 3.69 ERA–again, not bad for just starting out in the New York environment. But by June of ’05 Pavano got hurt for the first of many times. Truthfully, his injuries and disabled list stints piled up more than his actual baseball statistics. 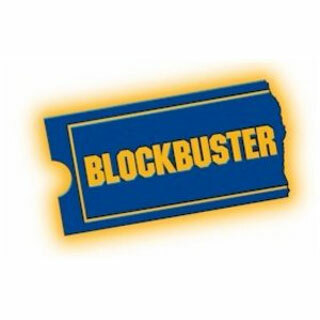 · Went on the DL in June of ’05 with right shoulder injury. Ultimately went 4-6 with a 4.77 ERA for the season. · Broke two ribs in a car accident in August of ’06; did not end up pitching at all in an MLB game. 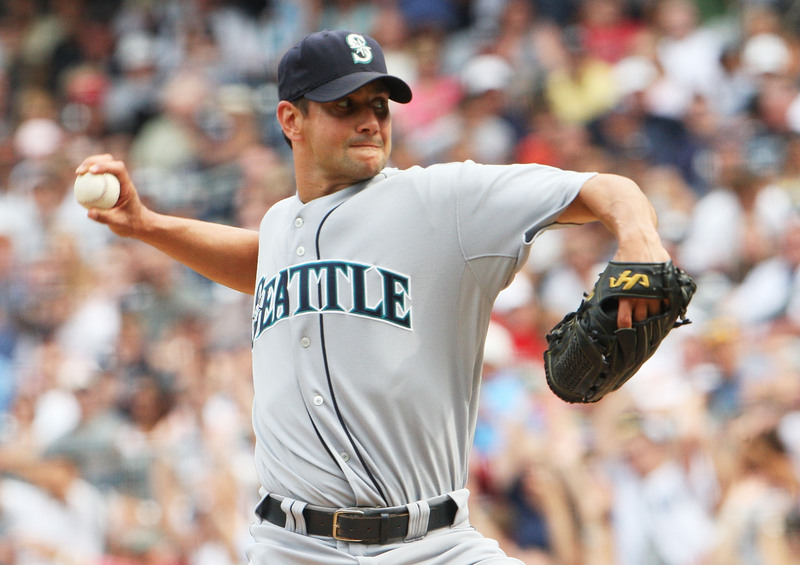 · On April 15, 2007 was placed on DL after what was diagnosed as an “elbow strain.” The next month Pavano announced that he would opt to have Tommy John surgery and missed the remainder of the year. · First start coming off Tommy John came on Aug. 23, 2008. He pitched five innings and gave up three runs on seven hits. · The next month on Sept. 14, Pavano left the game with an apparent left hip injury. I have two words for all that: cry baby. He never pitched a full season with the Yankees. What really struck me were Pavano’s comments after his last game as a Yankee. The press questioned him about his ineffectiveness and his repeated injuries; they were probably about as skeptical about his excuses as most fans were. Really? That’s the best he could do? $39.95 million should buy a little more thought than that. Pavano concluded his tenure (if you can even call it that) with a record of 9-8. Thank goodness one of his teammates spoke out against him. Quite honestly it needed to be done. In 2009 Pavano joined the Cleveland Indians and was traded mid-season to the Twins. I couldn’t even believe it when I noticed that halfway through 2009 he was one of the league leaders in wins. 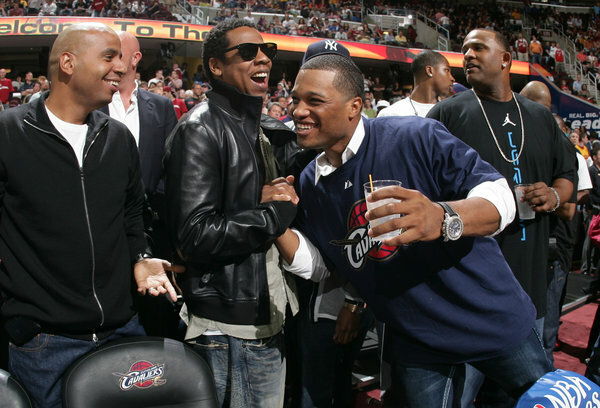 He even finished 2009 with a record of 14-12–winning five more games in one year with Cleveland and Minnesota than he did in four years with the Yankees. At any rate, it must have been fun for the Yanks to punish Pavano for all the grief he put them through by beating him in Game Three of the ’09 ALDS–en route to their 27th World Series title. 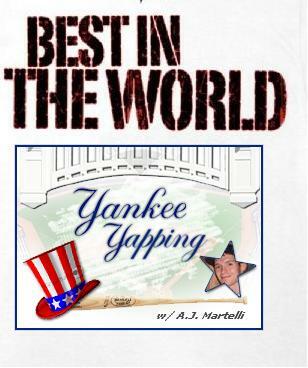 The Yanks also beat Pavano in the ALDS this past season, another satisfying moment for all Yankee fans. I decided to combine these last two players simply because they failed in pinstripes not once, but twice. I’ll begin with Javier Vazquez. The day after the Yankees were eliminated from the ALCS at the hands of the Texas Rangers, it was reported that Vazquez was already speaking to the Washington Nationals about possibly pitching for them in 2011. His talks with the Nats obviously cooled off, and as reported on Sunday, Vazquez has apparently agreed to a deal with the Florida Marlins. I have four words for him: good riddance, you bum. Before this past season began, Vazquez was acquired from the Atlanta Braves along with reliever Boone Logan. 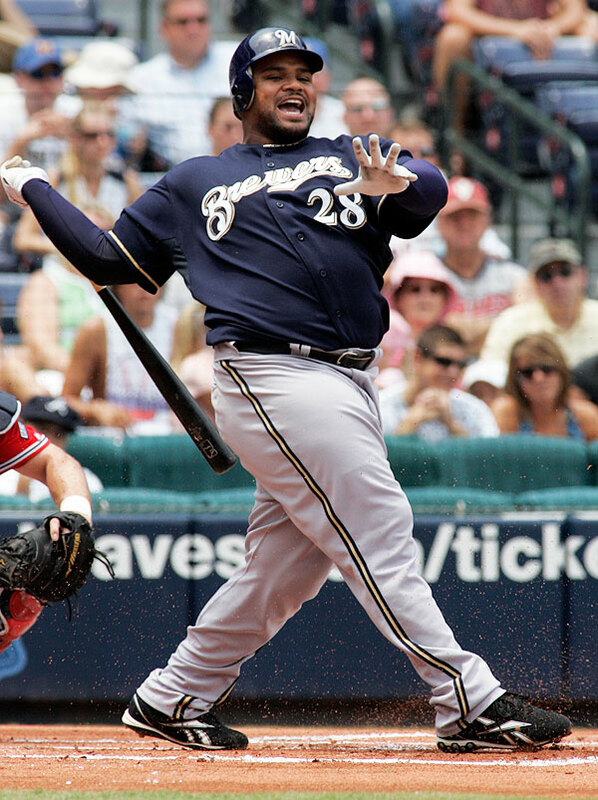 In exchange for Vazquez, the Bombers gave up young outfielder Melky Cabrera and rookie reliever Mike Dunn. I would not necessarily categorize the trade as a “Brock for Broglio,” although it kind of had that quality. Cabrera had an awesome year in 2009; he smacked three walk-off hits for the Yanks (including the first walk-off home run in the New Stadium), became the first Yankee to hit for the cycle since Tony Fernandez in 1995, and capped it all off with a World Series ring. Cabrera was a beast and was looked at as one of the most pleasant surprises in ’09. The Yankees however did need starting pitching. They only used three starting pitchers in the playoffs and were able to get over the hurdles on the strength of three horses: CC Sabathia, A.J. Burnett, and Andy Pettitte. They needed a fourth man and they looked to Vazquez. Why they wanted Vazquez, I’ll never know. Sure he was second in the National League when it came to ERA in 2009 (with 2.87) and he won 15 games for the Braves. I suppose the Yankees thought they would really be unstoppable if they could get that kind of production out of their number four starter–which made it somewhat understandable. Yet, the Yankees must have forgotten how Vazquez busted for them in 2004, which was his first stint in pinstripes. In ’04 Vazquez went 14-10 with a 4.91 ERA. Like Brown, he pitched in Game Seven of the ’04 ALCS, giving up a grand slam and a two-run homer to Johnny Damon–once again, not giving the Yankees a shred of a chance to come back and win the pennant. In 2010 Vazquez pitched to a 10-10 season record with a 5.32 ERA. He started 31 games and allowed 32 home runs, pitching so poorly throughout the year that he did not even make it into the postseason starting rotation. Was the trade really worth giving up Cabrera? Well I guess it didn’t matter. Cabrera finished 2010 with a .255 batting average for Atlanta and only hit four homers and knocked in 42 runs. 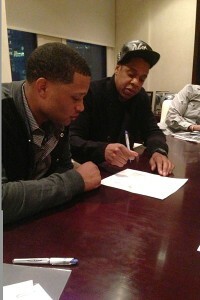 But that doesn’t erase what he did in 2009, and if he had played in the Bronx in 2010, he might have had a better year. The bottom line is that Vazquez was a bad move made by the Yankees. I knew he was going to bust before the season began; actually I knew he was going to fail again right after the trade was completed. It was just so foreseeable. And when he gave up that first-pitch home run to Jimmy Rollins on day one of Spring Training, I knew it was all over for him. And then there was Johnson. In 2001, Johnson served the Yankees as Tino Martinez’s backup at first base. When Martinez left for St. Louis after the season ended, Johnson became a little bit of a regular first baseman, albeit the Yanks did have Jason Giambi in their lineup and available to play first. Johnson would go on to rank seventh in the league in hit-by-pitches in 2002, but did put up a somewhat decent year in ’03. Johnson clubbed 14 homers and drove in 47 runs with a .284 batting average, but his injury-prone nature kept him from truly breaking out. The Yankees had no choice but to trade him at the end of ’03, ironically enough for Vazquez. Two useless Yankees got traded for one another. Really, what are the odds? And like Vazquez, as useless as Johnson was, the Yankees still could not manage to give up on him. 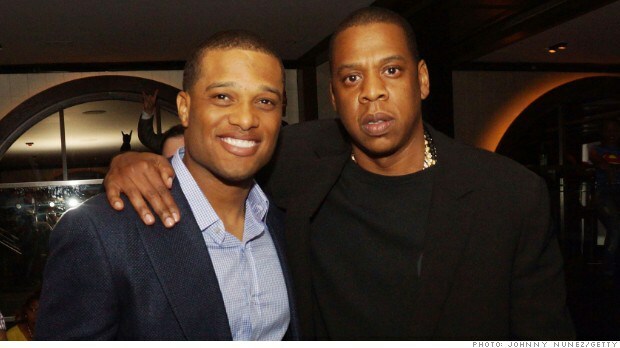 On Dec. 23, 2009 the Yanks signed Johnson back to a one-year, $5.5 million deal. This past year Johnson was expected to be the everyday designated hitter, taking up the mantle of the great, 2009 World Series MVP Hideki Matsui. Unfortunately, Johnson saw little action because of a wrist injury. In fact, before the season even began, Johnson injured his back in Spring Training, proving once again that he did not belong in a Yankee uniform. He finished 2010 very early with 24 games under his belt, only 98 plate appearances, two home runs, eight RBIs, and 12 runs scored. I would certainly characterize that as a waste of $5.5 million. The bottom line is, the Yankees have wasted a ton of money on terrible players and have given away some great players to get some rather mediocre ones. But they are not the only organization to do it; it happens to the best of teams. The Blue Jays gave the Yankees David Cone for three minor leaguers who never made it. And who could forget the New York Mets giving up Scott Kazmir for Victor Zambrano? Chan Ho Park–yes, Mr. Diarrhea himself–got $65 million from the Texas Rangers in 2002. Juan Pierre received $44 million from the Dodgers in 2007. Yes, baseball organizations are human and make bad moves sometimes. Maybe next week I’ll review some of the BEST moves the Yankees have made; off-season changes that have paid off royally and had a great impact on the team. I can think of quite a few right off the top of my head. And while I’m waiting, I’ll hope the Yankees can decide on the right moves. The Baseball Winter Meetings begin next week and I’m hoping the Bombers can make a splash in Orlando.